Minimal exposed surface & sealable gasket for infection control. Very little maintenance required while offering up to ±100mm of movement. A simple & economical solution ideal for low traffic areas. Refreshing options for worn-out and broken expansion joint covers. Gasketed floor joint covers have a minimal exposed surface, with a sealable gasket for infection control. These features make gasketed EJCs ideal for applications where hygiene is paramount, such as healthcare, kitchen operations and food retail. Available in surface & recess mounted options, these expansion joint covers can be used in conjunction with timber floors, vinyl, carpet, stone, ceramic & terrazzo tiles. To increase the visual blending and create an even more seamless appearance, it’s possible to embed the surrounding floor surface into the centre plate. Suitable for surface retrofit where tiles are used. Sealed with one durometer gasket at installation. Outer harder materials for stronger, more secure attachment to aluminum extrusions. Surface mounted joint covers featuring exposed aluminium frames which are recessed to take a 5mm thick carpet or vinyl floor finish. Recess mounted, single gasketed covers available in four frame depths to suit different floor finishes & situations. This flush floor cover is ideal for applications where minimal visual impact is preferred. It is sealed with one dual durometer gasket installation. This recess mounted, double gasketed EJC is designed for applications with large movement requirements. Deeper models can be installed in scenarios where varying joint widths exist (up to 110mm wide). The 3.2mm recessed centre plate is designed to accommodate bonded carpet, vinyl flooring or other suitable inserts. Maintains movement capacity even when installed over a range of joint widths, or uneven joint widths. Designed for large, seismic joints in substantial commercial projects with regular pedestrian traffic. Hygienic, co-extruded gaskets offer added thermal movement & water resistance. This EJC enables excellent concealment of large joints due to the recessed central plate that is designed to incorporate carpet or vinyl flooring. Metal expansion joint covers are generally intended for larger floor joints of up to 150mm wide. They are designed for a high movement range of up to ±100mm. In cases where there is nothing within the joint, such as a fire or moisture barrier, then some metal floor covers are able to close up to 100%. Metal EJCs benefit from a durable construction with very few (if any) perishable parts. This translates to a system that requires very little maintenance. Vehicles and goods handling trucks with tyres of hard plastics. The permissible load dependent on tyre width is 6.5kg per every mm of tyre width. Standard duty, aluminium EJC – recess mounted. Suited to tamper-proof applications where low maintenance is also required. Offering up to 100% horizontal movement of the joint width (up to 100mm wide). Standard duty, recess mounted EJC with a 3mm recessed side frame to accommodate vinyl floor finish. Offers up to 100% horizontal movement of the joint width. A sleek, seismic, all metal, clear-cut cover designed for large expansion joints. The cover’s locking mechanism disengages during movement activity, allowing movement in all directions, whilst remaining flush to the floor. Designed for conditions requiring heavy duty (2000Lb/907Kg.) point load. A bespoke model incorporating a stainless steel, flush fitting cover plate. A recess mounted EJC that offers a variety of movements, depending on configuration. A large seismic EJC that’s practically invisible. Handles multi-directional movement & is suitable for joint widths up to 250mm (interior or exterior areas). Can incorporate a variety of floor finishes and has built-in edge protection to eliminate floor surface clipping. This surface mounted EJC is designed to accommodate 3mm vinyl floors & carpet tiles. CSFM is a minimal movement joint cover with a natural anodise of 25UM coating with aluminium alloy 6061-T6. KLP can withstand high rolling loads, in both interior & exterior zones. It has a clean, sleek finish with a cover design that permits significant horizontal movement in the floor slab, while the turn bars keep the cover plate centred at all times. Maintenance is minimised due to the flush aluminium design that prevents dirt from entering the joints. 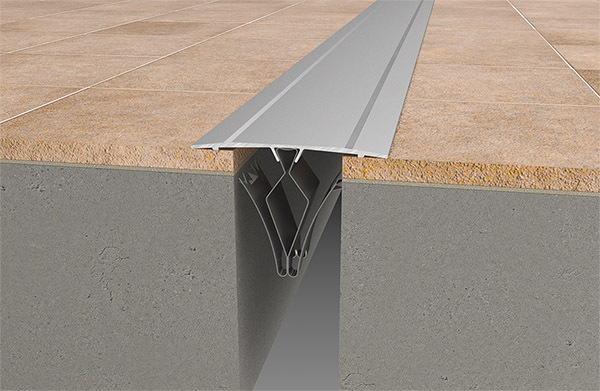 Cover strips offer a simple and economical way to cover a floor expansion joint. Cover strips generally just push into existing joints, or are screwed in on one side of the joint. The CS range of cover strips can cover joints up to 100mm. The movement range depends on the type of cover chosen. Easy to install system of rigid aluminium strips for covering floor expansion joints. Strips are supplied in 3m lengths with all the necessary fastening accessories. Aluminium cover strips are supplied with a natural anodised finish as standard, or can be powder coated upon request (subject to minimum order quantities). The Restofit Expansion Joint System is the ideal way to refresh broken or degraded expansion joint covers. Easy installation translates to minimal down-time and, in-turn, helps to minimize the costs associated with new and retrofit applications. Restofit models are suitable for a variety of floor finishes and require little maintenance. This extremely low maintenance, all-metal surface mounted cover is resistant to rolling loads, wear & distortion. Serrations create a slip resistant surface and the model is suitable for both interior and exterior use. 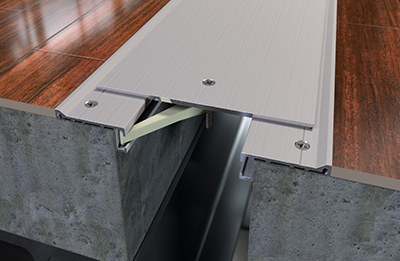 The unique interlocking cover permits horizontal movement in the floor slab in addition to some vertical deflection, however RFA is intended for applications where minimal movement is expected. This cover is designed for movement up to 100%. The self-centering aluminium cover plate allows for thermal movement and limited seismic movement. The cover is surface mounted and is designed for interior, new or retrofit applications. Designed for interior applications, RCF is suitable for new and retrofit applications. The self-centering cover plate temporarily displaces to slide over the floor surface during seismic movement, but remains flush with the flooring surface during thermal movement. RFD offers minimal installation time and requires little maintenance. The surface mounted aluminium cover is resistant to rolling loads, wear & distortion. RFD accommodates vertical offsets and a gradual taper minimizes the bump.